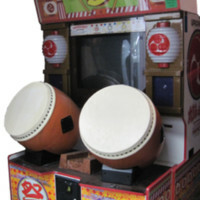 Steel enclosure with DVD player with circuit boards and connectors for Taiko no Tatsujin Drum Arcade Game. Unit enables upgrading to new song sets. Plexiglass and paper case decorations for a Taiko no Tatsujin Model 8 arcade game. Case decorations for NAMCO Taiko no Tatsujin Arcade Game, model 3, including plexiglass top panel, paper decoration for top, and 2 paper accent pieces. Arcade Drum Machine, Model 3, with drumsticks, etc.